Finding your daily commute dry and boring? Stuck driving at low speeds when all you want to do is tear up the roads at 300 km/h? From today – April 1 – you can order your BMW with what the company calls a Force Injection Booster (FIB), which simulates the effect of spirited driving even at slow speeds. Activated under speeds of 20 mph (32 km/h), FIB extracts the kinetic energy created by the engine and converts it into positive g-forces. These forces are then channeled directly to the driver and passengers through the air-conditioning vents. A mild electric current running through the front seats accentuates the feeling of exhilaration, while BMW’s AirNet hair protection system ensures that you can enjoy the benefits of FIB without ruining your carefully-coiffed hairstyle. Head of BMW innovation Professor Mika Notbetrü described the technology as “mind-blowingly unbelievable”. BMW said that Force Injection Booster will “change the face of motoring”, but smartly added that face alteration caused by the technology is not permanent. I heard Volvo is coming out with a competing tech called Learning Injection Ejaculator or LIE. The ECU’s powered by Big Little ARM Host-controller or BLAH. Hahaha… Nice name… Mika Notbetru = Might Not Be True!! Happy April Fool!!! might as well driving without windscreen.. 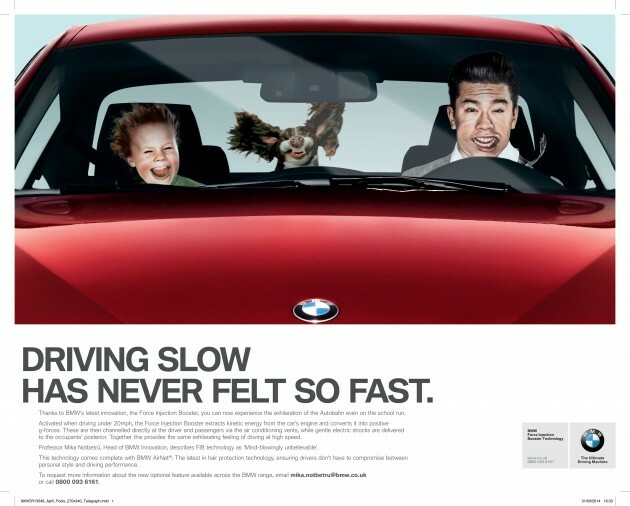 If I am not mistaken, every year BMW came out with an April Fool joke. There is once where they came out with the M3 UTE joke. if it’s real then it’s quit fun actually!!! Previous Post: Citroen C4 Cactus Arsenal Edition – 11 units only!